Strange and terrible things blossom deep within the Fangwood, twisting plant life and the fey residents into blighted monsters. Many have braved the forest, but Princess Arlantia—the cruel dryad who rules the forsaken woods—allows no trespasser to leave her realm. Yet somewhere within these cursed depths lies the key to the Ironfang Legion's hidden stronghold. Can the PCs survive wicked fey, a festering dragon, and nightmarish beasts? Or will they become prisoners of the blight? A bestiary packed with festering, fairy-tale beasts, by Paris Crenshaw, Crystal Frasier, and Amanda Hamon Kunz. 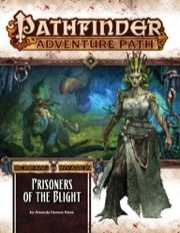 "Prisoners of the Blight" is sanctioned for use in Pathfinder Society Organized Play. The rules for running this Adventure Path and Chronicle sheet are available as a free download (2 MB zip/PDF). 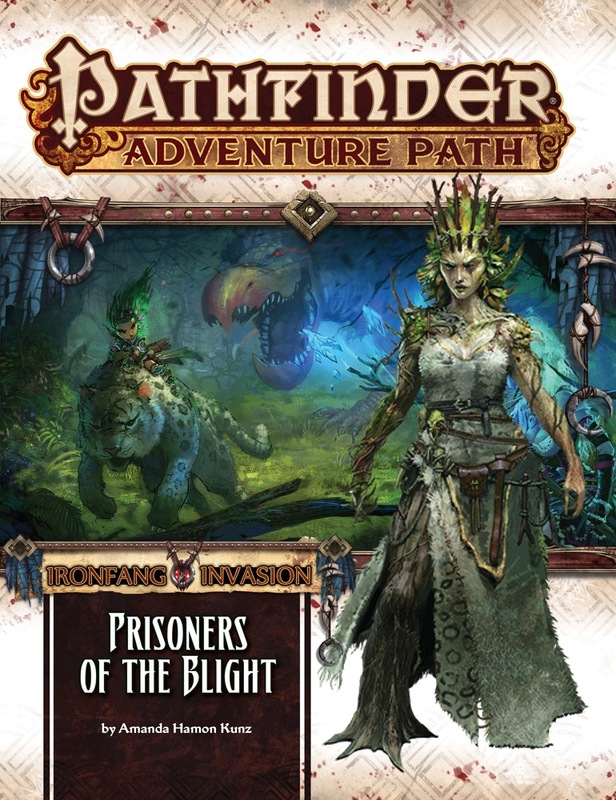 "Prisoners of the Blight," the fifth installment of 'The Ironfang Invasion' Adventure Path, is the weakest link in one of the best Paizo Adventure Paths in recent memory. This leg of the adventure picks up an indeterminate length of time ("a few days or weeks") after the events of Siege of Stone, with the player characters still recuperating at the dwarven sky citadel of Kraggodan. The players are approached by a dwarven scholar that they befriended during the previous adventure, who offers a suggestion that the fey folk of blighted Fangwood Forest-- sworn allies of Kraggodan-- might also make suitable allies against the invading hobgoblin marauders who have plagued the characters' homelands thus far. This leads the characters into a cursed (perhaps haunted?) wood, seeking to locate a mythical fey ruler, deliver a sound defeat to the blighted evil which infesting the forest, and hopefully lead the fey of Fangwood to join the alliance against the titular Ironfang Invasion. The resulting adventures, intended to take player characters from 14th to 16th levels, are interesting and well-written, but they also lead the players into side quests which feel like a further diversion from the primary hobgoblin threat; straying even farther away from the hobgoblin menace almost makes these encounters feel like they've been "tacked on" to the campaign's primary story arc. The beginning of "Prisoners of the Blight" also feels like it wraps up details which would have been better interwoven into previous NPC interactions in Kraggodan, only reinforcing my perception that the page count for "Siege of Stone" had probably run a bit long, requiring it to be trimmed a bit prior to publication-- and perhaps pushing some of the character interaction from that book to become text-box exposition material at the start of this book. That's a real shame, because the player characters should have developed genuine relationships with the dwarves of Kraggodan by this stage of the campaign, and the setup for "Prisoners of the Blight" could have been presented much more effectively as a two-way interaction (perhaps between the players and Kraggodan's entire Evenhanded Synod!) rather than being reduced to a bit of text-box background information. If the adventures in this book didn't present so much potential for fun roleplaying, that might be a problem, but "Prisoners of the Blight" somehow manages to pull it off-- yes, this installment still delivers the goods. For all of these reasons I docked "Prisoners of the Blight" one star, but I still consider it a decent enough installment in a truly great adventure path. Most of the encounters in this book take place in wooded rural wilderness, with a fair bit of exploring abandoned ruins-- and the blighted, decayed quality of the woods gives both locales a twisted, malignant ambiance, adding a lot of flavor to your game. In short, "Prisoners of the Blight" demonstrates that the weakest link in an incredibly strong chain can still be pretty darned solid. Not just any demon lord but Cyth V'Sug! Fey wonderland you say, interesting. Keep it up Paizo and I will actually have to buy my 2nd full AP--my first is Hell's Rebels. Absolutely love the Fey! Chances of raising a Fey army?! Thank you very much! You get to do anything fun in this one? Also, 14th level? Kicking it up a bit with this one, eh? LOL@Rysky. :) I'm sticking with hugs myself. That and I'm glad I didn't eat all the mushrooms on the pizza tonight. So the bad guys are just kind of ignoring Molthune? From the description, it sounds like Nirmathas is mostly dealing with Molthune at the time of the "Ironfang Invasion". Essentially, it implies that the Hobgoblin invasion is a side-show to the war with Molthune, rather then an existential threat. "a review of the faith of Cyth V'sug, demon lord of filth and pollution"
Ponders how ridiculously bad@$$ General Azaersi must be. 1) What is the creature on the mock-up cover? She(?) looks like a faun? 2) When will you announce the last volume of this adventure path? Does it have a title yet? I'm guessing it'll have to wait til after the holidays. What is the creature on the mock-up cover? She(?) looks like a faun? It's from Guide To The River Kingdoms. No idea what it is exactly. puts on rose colored Lennon shades. Ah nostalgia, my old friend. Ooh, featuring Treerazer's estranged boss...even more hype. Yep. I'm looking forward to more details on Cyth V'sug's worshippers. Wow, a "Jubjub Bird" (Bestiary 3 page 157, CR 15) chasing Lini - great cover! I'm guessing that Princess Arlantia is a worshiper of Cyth-V'sug and that her kingdom within the Fangwood is a major spot of worship for the prince of the blasted heath? Or am I wrong on both counts? I really like the cover. Awesome evil dryad! Eh, when is this coming out? Next week I believe...well subscriptions anyway. What are the new critters? Faerie Mount? Yeah any one out there with a nice bestiary listing? I'd like that! Sorry, distracted by the dire corgi. Ugg. My still hasn't shipped. I don't like this waiting until Thursday thing, I really want to see this! For sure! I just really want to read this one! ah you are correct...I just quickly double checked and the picture was opposite the text for the Snark, which is diminutive. Quite a bit of beasties in this one!